After J Jayalalithaa’s death, Lankan Tamil community that had her support is waiting and watching what would be the next step of her successors. 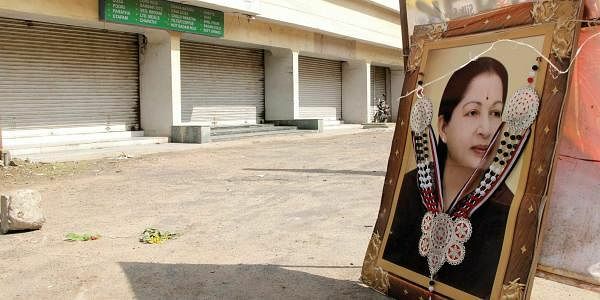 Shops remained closed in Chennai a day after former CM J Jayalalithaa’s demise. COLOMBO: After J Jayalalithaa’s death, Lankan Tamil community that had her support is waiting and watching what would be the next step of her successors. involvement in the Sri Lankan Tamil issue began almost immediately after she joined the AIADMK in 1983. It was later that year that over one lakh Sri Lankan Tamil refugees poured into the state, pushed out by the anti-Tamil riots in Sri Lanka in July that year. Sensing a great political opportunity, the M Karunanidhi-led opposition DMK took the lead in supporting them. This left AIADMK leader and then CM M G Ramachandran with no option, but to join the Eelam Tamil bandwagon. The party was galvanised and the new propaganda secretary Jayalalithaa was the face of AIADMK on the Sri Lankan issue. But once the public fervour died down, the Indo-Sri Lankan issue was taken over by the Centre and Jayalalithaa ceased to have a role in the matter. A believer of non-violence, she was shattered by the assassination of Rajiv Gandhi in May 1991. She then rode the anti-LTTE and anti-DMK wave and became CM in 1991. By 1991, Tamil militancy and the counter-measures taken by the Sri Lankan Navy in the Palk Strait had revived the Kachatheevu issue. TN fishermen, who were suspected of aiding the LTTE and other Sri Lankan Tamil militants, were shot by the Lankan Navy leaving many injured or dead. Jayalalithaa blamed the transfer of Kachatheevu to Sri Lanka by two treaties in 1974 and 1976 for this as TN fishermen said that they were being attacked near Kachatheevu, around which they had a right to fish as per an understanding between India and Sri Lanka. The Lankan Navy, on the contrary, argued that TN fishermen were intruding well beyond Kachatheevuand poaching in Lankan waters. But Jayalalithaa stuck to her guns, and got the State Assembly to pass a resolution seeking the “retrieval” of Kachatheevu as it had been handed over to Sri Lanka disregarding historical antecedents and without consulting the stakeholders in TN. To prove her superior credentials as a defender of TN fishermens’ rights, she even approached the SC in 2008. Jayalalithaa tried to divert Palk Strait fishermen from shallow water trawling to deep sea fishing and sought around `1,055 crore from the Center for the switch over. In the absence of Central funds, she started a project worth `51 crore on her own. The arrest of TN fishermen continued, forcing Jayalalithaa to write to the Centre seeking action against Sri Lanka. Jayalalithaa got involved in the Sri Lankan Tamil political issue only in 2011 when a post-war humanitarian crisis in northern Sri Lanka drew international attention. The treatment of the three lakh war-displaced people in camps and charges of war crimes levelled by human rights organisations and the UN began to draw the attention of politicians in TN. On coming to power in 2011, Jayalalithaa pro-actively got the State Assembly to pass a resolution seeking economic sanctions against Sri Lanka and action against Sri Lankan President Mahinda Rajapaksa and others “war criminals”. These uncompromising actions were much appreciated by Sri Lankan Tamils who had reposed great faith in her. Even President Maithripala Sirisena and Prime Minister Ranil Wickremesinghe lauded efforts her after her demise.